A new rose, David Austin’s Kew Gardens, has been giving endless pleasure this year. This is only their second summer, but the bushes have flowered almost consistently since early May and are heavy with emerging buds. 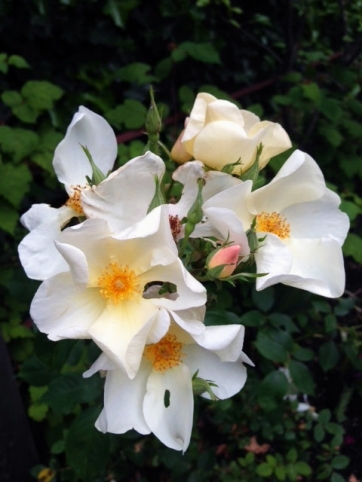 It is the simplicity of this rose that appeals, from a pointed apricot coloured bud, it opens to small, single flower of five or so ivory white petals, each with a pale lemon centre. The stamens are many and a soft golden yellow. Thornless, short and bushy, this rose suits my small garden, and its hydrangea like heads work amongst the box hedging. Single and with such a simple constructed collection of petals it reminds me of the dog roses that grew so prolifically in the country lanes when I was growing up. Roses which, incidentally, I miss more than any other plant save the scarlet poppies that were to be found in every field. Named in celebration of the 250th anniversary of Kew Gardens, I admired this rose from the moment I saw it at RHS Chelsea in 2010 and ordered several bare-root pants then and there. Roses are a great joy to me, the many petalled cottage garden varieties, the French climbers and the mutli-hued mutabilis, but the charm and simplicity, not to mention the good health of Kew Gardens makes it one of the most worthwhile additions to the garden.